Market leading law firm Convey Law are the first conveyancers to launch a fully automated chatbot that can provide instant conveyancing quotes to customers using the QuoteXpress Conveybot. 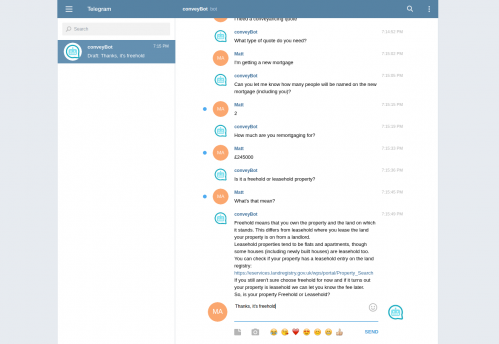 The Convey Law chatbot was built using the Conveybot add-on to the popular QuoteXpress platform. Conveybot enables law firms to automate the process of helping customers obtain accurate conveyancing quotes, as well as allowing scheduled follow up conversations to be initiated automatically through the chatbot. Conveyancers can add their own FAQ’s to the chatbots knowledge base, allowing it to answer questions most commonly asked about quotes, and guide the customer towards instructing the law firm automatically. If the chatbot does not know the answer to a question, a member of the customer services team can take over, and the bot can learn from them. Over time, the bot will have learnt the answers to more and more questions, meaning that customer service staff are only asked to take over conversation when more complex questions arise. “Our service is the first service of its kind to deliver conveyancing quotes directly to consumers through the communication channels that they already know and love - such as Facebook Messenger, Skype, Telegram and SMS. All conversations that take place between the chatbot and consumers can be viewed through the QuoteXpress platform. Conversations can be passed from the chatbot to the customer service team (and back) at any time - striking the perfect balance between automation and personalisation in client communications. Conveybot will be available to demo on the Tonic Works stand at LegalEx later this month (stand L514). Law Firms will be able to able to register on a first come first served basis to be part of the first wave of firms to receive their own bots when Conveybot becomes available to the whole market on June 5th.